By following the following steps you'll get a category, which is only accessible to Authors (users, who create new articles that require a review) and Reviewers (users, who approve/decline these articles). Reviewers will get an email notification for a new or updated article in this category. Users who are not Reviewers or Authors will not see new articles until they are approved by a Reviewer. Create a restricted category (e.g. named "Articles For Review") and limit access to it for Reviewers and Authors only. 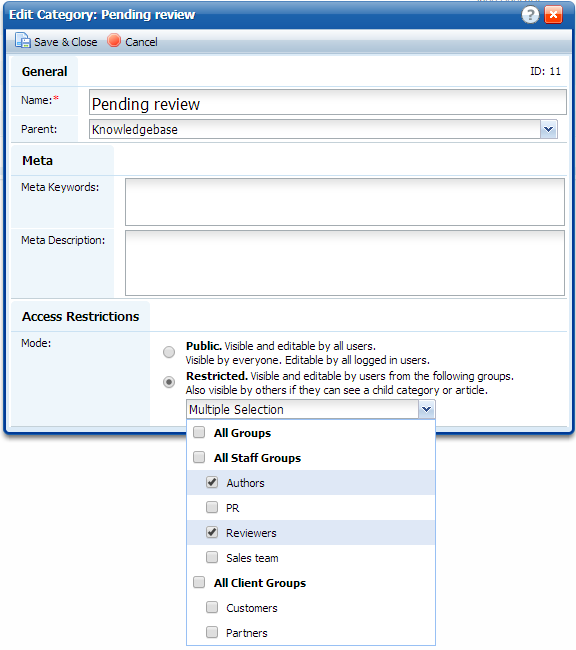 Create two groups: Authors and Reviewers on Users & Groups > Staff > Staff Groups page. Uncheck the permission "Articles: Change Restrictions" in the Authors group. This will prevent them from changing article permissions, so new articles would always inherit permissions from the restricted "Articles For Review" category and thus wouldn't be exposed to others. Subscribe reviewers to "Articles For Review" category on the Articles > Subscribers > Category Subscribers page. When Author creates a new article in "Articles For Review", subscribed Reviewers will get a notification email. Reviewer can approve the article by moving it to the target public category (where article should be put to) or reject it by writing an email to the author. If Author (or anyone else) updates the article, Reviewers also get a notification email.